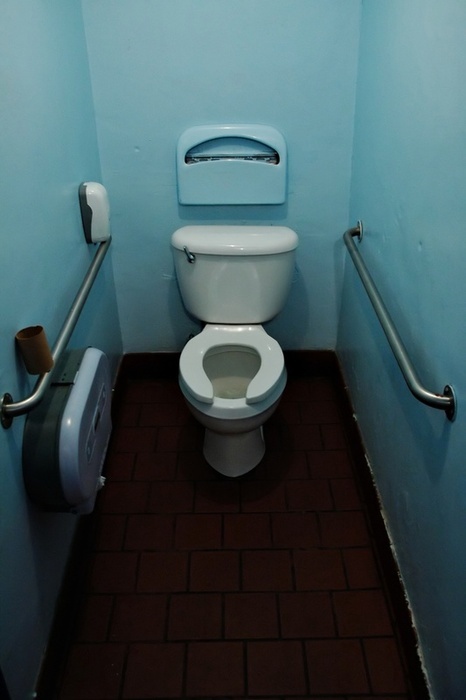 Some restrooms at smaller places, such as coffee shops, usually are Single Rider restrooms. This particular type of restroom only has a one person limit with one toilet, one sink, one of everything. They’re very comfortable, actually. Not having to deal with stalls, or making eye contact with other people and no need to follow urinal laws. The experience, however, has a different side to it; a very uncomfortable one. After having to hold it for a while, you finally find a restroom and head right in. You poop (while checking your email, new text messages, perhaps play a short Angry Birds session on your iPhone, you know, the usual), and feel very relaxed. Suddenly, you hear something unexpected. A knock on the door startles you and then you begin to feel the pressure. That’s right, friend. That is one of the sacrifices we must make in order to enjoy the luxury of one of these restrooms. At this moment, you must say something, otherwise this gives the person waiting full right to attempt to open the door. A typical response is “BUSY!” That should keep them away; well maybe just a couple of meters from the door anyway. It can be very uncomfortable to be rushed when you’re taking care of business to know that someone is waiting for you to finish. It might even cut off the drive you had built up. Once you finish though, follow post-restroom protocol please. Fortunately for you, there is a quick way to remember what to do before you leave the restroom. Just remember C.H.I.T. C- Cover. The seat cover must’ve flushed. Oh and make sure its not stuck to your pants. It doesn’t only happen in movies, trust me. H- Hair. Leaving hair on the toilet seat or anywhere in the sink is just not cool, please remove it. I- Instruments. Make sure that all bathroom equipment is fully functional, and that your poop has left the toilet bowl. T- Toilet paper. All soiled paper must be properly disposed of. What this acronym will not save you from, though, is the awkwardness that comes after leaving the restroom and having an encounter with the person that was waiting. The last thing they saw before they stepped into restroom was your face, and their objective as soon as they step in is to assess the environment, primarily the odor. “..sorry..” Or they might just smile at you. I’m still not sure which one of those is most awkward, but they’re all pretty high up there. Don’t worry though, usually people that are willing to wait for you outside of the restroom probably have to use it badly, so they won’t mind the smell that much (unless its toxic), but they will mind anything on the CHIT list. Ok, so Women can be so gross. I don’t know if you’ve had the pleasure of using a Unisex bathroom that a woman has left a mess. That’s right up there with floaters or worse. EW!